Published Dec 19, 2016 by Addison-Wesley Professional. Part of the LiveLessons series. Learning Node.js LiveLessons provides developers with a practical introduction to Node.js, an important platform for developing web and network applications. Marc Wandschneider has more than 20 years of experience as a developer and is the author of two programming books and one other LiveLessons video training. 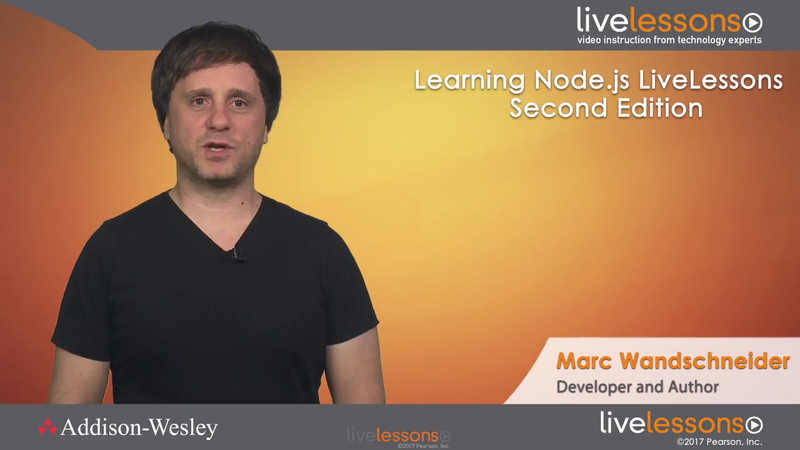 In this video training, Marc starts by introducing Node.js, installing, and running it. The video then moves into writing JSON servers, web applications, client-side templates, and continues by covering database access to both SQL and NoSQL database servers. After watching this video, developers will begin to understand why Node.js inspires so much passion, and they will be able to write fast, compact, and reliable applications and web server. Lesson 7: Building Web Applications Easier with Express7.1 Install Express and write Hello World7.2 Route requests7.3 Update your app for routing 7.4 Understand REST API design7.5 Factorize your code with modules7.6 Explore Express middleware7.7 Clarify the importance of ordering in middleware7.8 Replace static file handling in the app with middleware7.9 Support POST data, cookies, and sessions7.10 Upload files7.11 Support authentication in NodeJS.